Can You Take Garlic Pills for High Blood Pressure? 2 How Does Allicin Work? How Much Garlic/Allicin Should I Take? Garlic and garlic extract have been used to treat hypertension for hundreds of years. Bearing in mind that there are over 70 million people with hypertension in America alone, most of them aged 65 years or older; it may be more sustainable to consider garlic as a viable alternative to conventional drugs. Garlic can be taken in various forms including raw and garlic extract pills. 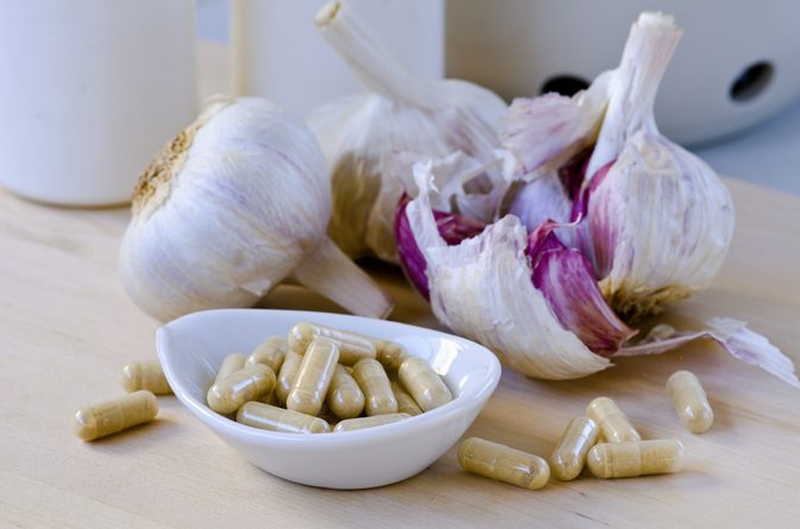 But how effective are garlic pills for the high blood pressure? Some studies indicate that taking garlic can lower blood pressure by about 10 per cent. However, according to one study, this is only possible when garlic is taken in pill form. A review of several studies found that taking garlic tablets for 12 weeks causes a substantial drop in blood pressure. This reduces the risk of developing cardiovascular complications such as stroke and heart attack. Other studies indicate that people with high blood pressure can benefit from taking garlic in addition to conventional hypertension drugs. However, taking garlic pills for high blood pressure is more effective than consuming garlic in its ordinary form. According to experts, while allicin, a bioactive compound is produced when garlic is crushed or chewed, it is destroyed by heat. Besides, taking garlic tablets ensures that you don’t suffer from the bad breath that is inevitable when you eat fresh garlic. As you consider taking garlic supplements, look for those containing at least 1.8mg of allicin per dose. Studies conducted since 1990 have shown that this amount of allicin is potent enough to achieve a 10 percent drop in blood pressure. Studies have also established that powdered garlic is more potent than garlic oil. Garlic contains bioactive compounds known as sulfides of which allicin has antihypertensive properties. Allicin is most abundant in extract from mature garlic extract. Crushing or chopping fresh garlic also produces allicin. Besides allicin, garlic contains another organic compound known as s-allyl cysteine (SAC). Studies suggest that SAC has cholesterol-lowering properties. Garlic also contains polysulfides which enhance production of nitric oxide (NO) by the endothelium. NO enhances health of the cardiovascular system and stimulates production of a vascular gasotransmitter, hydrogen sulfide. The overall effect of these compounds is vasodilation (relaxation of blood vesses) so that blood flow is smooth, thereby lowering blood pressure. Researchers say that deficiency of sulfur may have a part to play in the occurrence of high blood pressure. There is no indication that garlic interacts with hypertension medications in any way. Allicin lowers blood pressure by causing the blood vessels to relax which reduces pressure and damage. Allicin also reduces contraction of the muscles along the blood vessels by increasing production of muscle-relaxing enzymes. Besides being antihypertensive, garlic has antibacterial, anti blood coagulation, antioxidant, anticancer and lipid lowering properties. Many studies have found that allicin reduces LDL, total cholesterol and triglycerides levels, but increases high-density lipoprotein (HDL) cholesterol (good cholesterol). Allicin is therefore an agent for enhanced circulatory system health thereby reducing the heart attack and stroke risks. If you are considering taking garlic pills for high blood pressure, you need to know the quantity that will have the desired effect. It is generally recommended that you take two doses of 600 mg to make 1,200 mg daily. One study had people with hypertension taking different doses of garlic in the range 300 – 1,500 mg daily. A placebo and hypertension medications were also administered. It was found that garlic had the same blood pressure lowering effect as the medication. However, higher dosages of garlic taken over a long period achieved better results. While garlic and its active ingredient, allicin are generally beneficial to health, they may have minor adverse effects for which caution should be exercised. Garlic may thin blood and therefore interfere with blood clotting. This effect also happens with aspirin and may become an issue in case of surgery. For this reason, use caution if you have a bleeding disorder, are preparing for surgery, including dental surgery. Garlic may also have other side effects including heartburn, upset stomach, halitosis, body odor and allergic reactions. Garlic supplements may also interact with a HIV medication known as saquinavir. Clinical studies and observation of populations have established that taking higher amounts of vitamin C lowers blood pressure by as much as 4.5mm Hg for systolic blood pressure and by as much as 2.5mm Hg for diastolic blood pressure. Vitamin C is believed to lower blood pressure by excreting lead from the body. Some studies link increased cases of high blood pressure and death from heart disease to chronic exposure to lead. Deficiencies of Coenzyme Q10, also known as ubiquinone are believed to be responsible for 39 percent of high blood pressure cases. Analysis of various clinical trials conducted since 2007 show that CoQ10 can reduce blood pressure by as much as 17mm Hg systolic pressure and by up to 10mm Hg diastolic pressure in people with hypertension. Supplementation with CoQ10 is recommended at the rate of 100mg twice or thrice daily taken with meals containing some fat. Studies have established that the two minerals, calcium and magnesium reduce blood pressure. Analysis of various clinical studies shows that calcium can lower blood pressure by 13.6mm Hg, systolic pressure and by 5mm Hg diastolic pressure. Magnesium can lower blood pressure by 4.3mm Hg systolic pressure, and by 2.3mm Hg diastolic pressure. Note that magnesium and calcium are required together to prevent heart complications that can result from too much calcium without corresponding amounts of magnesium. Most American diets are low in omega-3 fatty acids. This is thought to partly explain the increased cases of hypertension in the United States. More than 60 studies have shown that increased intake of omega 3 or fish oil can help to lower blood pressure. Fish oil contains substantial amounts of omega 3 and has been shown to lower systolic blood pressure by up to 2.1mm Hg, and diastolic blood pressure by up to 1.6 mm Hg when taken at dosages of 3,000mg eicosapentaenoic acid (EPA) and docosahexaenoic acid (DHA) daily. The richest food sources of omega-3 are salmon and rainbow trout fish, and ground flaxseed. In addition to these, and besides garlic pills, there are many other natural treatment options for hypertension. These include hibiscus tea, beet juice, passionflower, black cohosh, chamomile, hawthorn, valerian, dandelion leaf, reishi mushroom, oatstraw, potassium, folate, vitamin B6, vitamin D2, taurine, homeopathic remedies such as natrum muriaticum, nux vomica, lachesis, argentum nitricum, belladonna and glonoinum. Server responsed at: 04/25/2019 2:23 p.m.